We need an introductory sentence to go over the references here. Smith DJ, Karlnoski RA, et al. The treatment of partial-thickness burns with a hydroconductive wound dressing: clinical and mechanistic effects. Surg Sci. 2013;4:268-272. Spruce P. Preparing the wound to heal using a new hydroconductive dressing. Ostomy Wound Manage. 2012;58(7):2-3. Schultz GS, Sibbald RG, et al. Wound bed preparation: A systematic approach to wound management. Wound Rep Regen. 2003;11(Suppl 1):S1-S28. Robson MC. 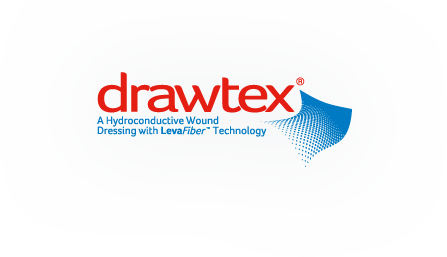 Innovations for wound bed preparation: The role of Drawtex hydroconductive dressings. Wounds. 2012;24(9) (Suppl):2. Wolvos T. Analysis of wound bed documentation in advanced wound care using Drawtex, a hydroconductive dressing with LevaFiber technology. Wounds. 2012;24(9)(Suppl):9-10. Wolcott RD, Cox S. The effects of a hydroconductive dressing on wound biofilm. Wounds. 2012;24(9) (Suppl):14-16. Ortiz RT, Moffatt LT, et al. In Vivo and In Vitro evaluation of the properties of Drawtex LevaFiber wound dressing in an infected burn wound model. Wounds. 2012;24(9) (Suppl):3-5. Ochs D, Uberti G, et al. Evaluation of mechanisms of action of a hydroconductive wound dressing (Drawtex) in chronic wounds. Wounds. 2012;24(9) (Suppl):6-8. Nwomeh BC, Yager DR, et al. Physiology of the chronic wound. Clin Plast Surg. 1998;25:341-356. Tarnuzzer RW, Schultz GS. Biochemical analysis of acute and chronic wound environments. Wound Rep Regen. 1996;4:321-325. Mast BA, Schultz GS. Interactions of cytokines, growth factors, and proteases in acute and chronic wounds. Wound Rep Regen. 1996;4:411-420. Wendelken M, Lichtenstein P, et al. Detoxification of venous ulcers with a novel hydroconductive wound dressing that absorbs and transports chronic wound fluid away from the wound. Wounds. 2012;24(9) (Suppl):11-13.